Young Living proprietary blend was university tested and found to be highly effective in supporting the immune system and good health. This proprietary blend has also been documented to kill over 99.96% of bacteria it comes into contact with. Clove (Syzygium aromaticum) has a sweet, spicy fragrance that is stimulating and revitalizing. An important ingredient in Thieves® Blend due to its wonderful immune-enhancing features, its principal constituent is eugenol, an element that is used in the dental industry to numb gums. Clove is the highest-scoring single ingredient ever tested for its antioxidant capacity on the ORAC scale. immune function. It helps promote leukocyte formation and lymphatic function. popular it was the main reason behind the occupation of Ceylon by first the Portuguese, then the Dutch and then the British. diffusing, and even direct inhalation. It has long been an ingredient in some of our most popular blends. oil, it may be beneficial for helping to restore mental alertness when experiencing fatigue. * Caution: Do not use on children under 4 years of age.) It is also a popular ingredient in skin and hair care products. causing bacteria, viruses and other pathogens. 1. Dilute with V-6™ Enhanced Vegetable Oil Complex and apply to cuts or open wounds that may assist in the prevention of infection and may assist in promoting healing. 2. Mix with a tablespoon of water, gargle and swallow for a sore throat. 3. Apply undiluted directly to the skin of your upper chest and throat for bronchitis. 4. Place a drop on your thumb and apply to the roof of your mouth for a headache. 5. At the onset of a cold put 10-12 drops in a size 00 capsule and swallow for 3-5 days. 6. May assist acne by applying to the skin diluted with Young Living’s V-6™ carrier oil. 7. Put directly on the soles of your feet to assist in the prevention of colds and flu. 8. Inhaling the Thieves® Blend may assist lung congestion. 9. Use to clean pet cages, creating a healthier environment for them. 10. Add to your dishwasher for cleaner dishes. 11. Add to your laundry cycle for cleaner clothes. 12. Add to your mop water for cleaner floors. 13. Use as an insect repellant for your flowers and plants. 14. Use to dissolve the gummy adhesive on price labels. 15. Apply to bee and wasp stings to neutralize the toxin and relieve the pain. 16. Application to gums may prevent and assist with gum disease. 17. Apply orally to maintain healthy teeth. 18. Apply to gums and teeth to assist with pain relief. 19. Diffuse in homes or business to solve mold problems. 20. Add to orange juice and drink to assist in the reduction of phlegm and congestion. 21. Apply to broken bones or joints to assist in pain relief. 22. Put a drop in your cup of tea for flavor. 23. Put on the tip of your tongue to help you stop smoking. 24. Put on cold sores and canker sores. 25. For warts, apply topically, inhale and ingest in capsules. 26. Rub on sore joints. 27. Drink a few drops in water or juice every three hours at the onset of a cold. 28. Place a drop on the tongue and a drop in a glass of water every day to assist with herpes. 29. Rub on the bottoms of children’s feet for protection before school every day. 30. Diffuse in the house as your children come home from school every day to kill airborne bacteria. 31. Mix 50:50 with V6™ vegetable oil and rub on daily for relief of shingles. 32. Apply a drop on wound of a cat or dog to enhance healing. 33. Diffuse in the home or office to stimulate a cheerful mood. 34. Diffuse in the office to increase concentration and work efficiency. 35. Diffuse in your place of business to ward off germs. 36. Diffuse in the classroom to reduce student sickness and absenteeism. 37. Put a few drops in your carpet steamer/cleaner to disinfect carpet. 38. Mix a few drops with honey or agave in a teaspoon for cough relief. 39. Breathe and apply to assist with sinus headaches. 40. Put a drop on a pimple. 41. For laryngitis put a drop under your tongue. 42. Inhale for relief of allergy symptoms. 43. Take a capsule full every day for relief of Lyme disease symptoms. 44. Carry a bottle on every flight to protect you against germs on the plane. 45. Drop in the heat/AC vents of a hotel to reduce airborne germs. 46. Mix with baking soda to clean bathtubs. 47. Apply undiluted to the toes and feet to assist in case of fungus. 48. Apply to poison ivy rashes (may need to be diluted with vegetable oil) to relieve the itch. 49. Drop Thieves® Oil Blend on a cloth to remove permanent marker stains. 50. Sanitize pierced earrings by cleaning with Thieves® Oil Blend. 51. Rub on the big toe before retiring to assist eye vision. 53. 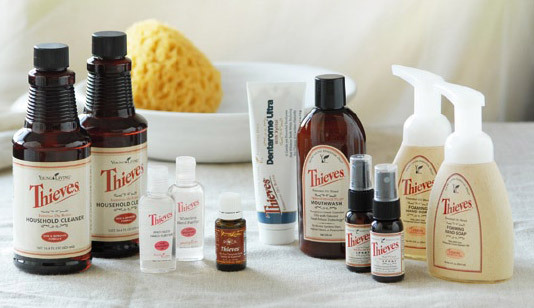 Apply 1 drop of Thieves® Oil Blend onto toothbrush to sanitize. 54. Use for bathrooms and toilets to sanitize and freshen. 55. Use to cut grease on kitchen counters and stovetops. 56. Use to mop floors to clean and disinfect. 57. Apply to hands to remove stubborn, sticky substances like tree sap. 58. Use to wash fruits and vegetables from the supermarket. 59. Add to the water in your vacuum cleaner/steamer to cleanse the air and disinfect the carpet. 60. Spray along ant trails in the house to keep them out. 61. Use to wipe chairs and furniture in school classrooms to cut down on student sickness. 62. Scrub old floors to remove old varnish and prepare for refinishing. 63. Clean upholstery. A spot test is recommended in an inconspicuous place. 64. Clean the upholstery and dashboard of your car. A spot test is recommended in an inconspicuous place. 65. Soak off burnt food in pots and skillets. 66. Wipe or soak garbage cans to get them clean, sanitary and smelling fresh. 67. For tough stains, pour it on as a pre-wash stain remover. 68. Use undiluted to clean and kill mold on walls and floors or degrease oven. 69. Take with the first sniffle and signs of a cold or sore throat to ward it off. 70. Take prior to speaking and singing performances to assist the voice. 71. Take when a cold or flu has been contracted. 72. Place in mouth as you enter an airplane. 73. Use as a healthy alternative to soap and water to sanitize hands. 74. Rub on hands to make them soft, fresh and smooth. 75. Apply to face to assist with acne. 76. Rub on stains as a pre-wash stain remover. 77. Use as a deodorant or hand soap. 78. Wipe doorknobs and other things touched by the public. 79. Use to clean children’s hands when traveling. 80. Use on the steering wheel and gearshift of your vehicle. 81. Use on public telephones to remove germs. 82. Use on public computer keyboards and mice. 83. Spray on doorknobs in public restrooms. 84. Spray in the throat to assist with laryngitis. 85. Spray hands before and after shaking hands with a lot of people. 86. Spray in restrooms on airplanes. 87. Spray on vegetables and fruits when washing them. 88. Carry for protection in countries with cholera, malaria or dysentery. 89. Use as an air freshener for cooking odors or other unwanted smells. 90. Take to the gym and spray all the equipment you use. 91. Take to the supermarket and use to disinfect shopping cart handles. 92. Use in the classroom for desks, tables and other items handled by children. 93. Spray in your mouth which may assist in the relief of sore throats. 94. Spray on shower stalls and bathroom walls to kill and remove mold. 95. Rinse daily for clean breath and to keep teeth and gums healthy. 96. Gargle for assistance in clearing mucus. 97. Brush every day to assist in the prevention of cavities. 98. Use when teeth have been damaged or broken to help them heal. 99. Use to assist in the prevention of gum disease. 100. Apply as an underarm deodorant. 101. An all-natural dental floss infused with Thieves® and Peppermint essential oils. 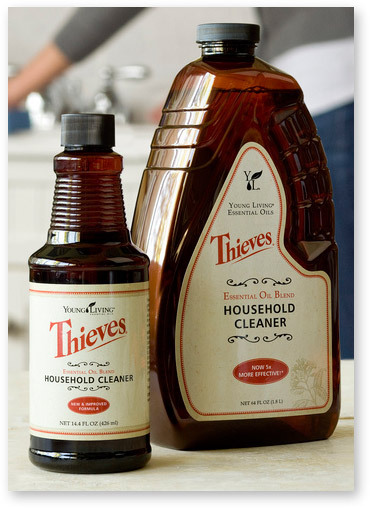 One capful of Thieves® Cleaner = 1 tsp. Best if used with purified water (do not use water that contains chlorine). The GOAL is a chemically free environment. Fabrics: 1 capful Thieves® Cleaner to 2 cups water – A spot test is recommended. Diffuse the Thieves® Oil Blend continuously for 24 hours in the room containing mold. visible mold with Thieves® Household Cleaner.